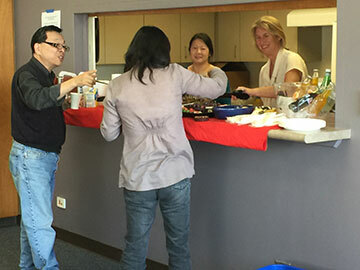 The College of San Mateo chapter of AFT 1493 partnered this year with the Center for Academic Excellence to celebrate the third annual Part-Timer Appreciation Day on May 12th, marking the occasion with company, delicious food, and provoking discussions. Professional Development Coordinator and Biology Professor Theresa Martin spearheaded the partnership with AFT 1493, approaching the union with the idea of both organizations co-sponsoring the event, which made for the most successful Part-Timer Appreciation Day yet. There were over 25 people in attendance, with guests arriving at different points during the event, to enjoy the refreshments, and get a chance to chat with faculty from many different departments. CSM President Michael Claire, Sandra Comerford, Vice President of Instruction, and SMCCD Trustee Maurice Goodman also joined various department deans to celebrate the contributions of part-timers to the academic and community life of the college. Without being humble, what do you value most about yourself as a learner, instructor or colleague at CSM? – a moment when we feel really good about the work we are doing and what we are contributing. As you think back on your learning experiences, tell us about one of the most exceptional learning moments in your life. Who was involved? What about that experience made you feel most involved and most excited? Is there an area in your work where you’ve been successful building good relationships that positively affect that work? How would other areas of your work be changed if those same qualities existed in those relationships too? place in which great learning and teaching take place on a daily basis. After perusing and reading the responses, President Claire and Trustee Goodman both expressed their warm regards for the part-time faculty at the College of San Mateo, and faculty shared their thoughts and experiences about working at the college. Part-timers expressed a sense of being valued as colleagues at CSM, a sentiment expressed historically at the two previous Appreciation Day celebrations. The part-time faculty at the event agreed that CSM is one of the most satisfying of the numerous colleges at which they work, in terms of feeling like a peer and being treated with respect.